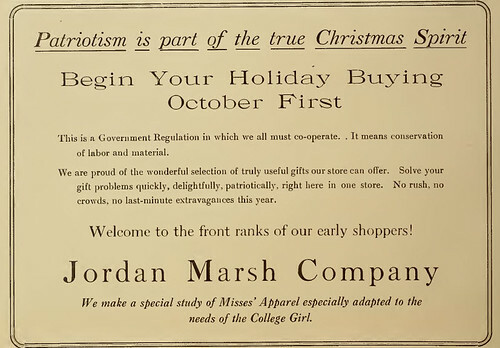 An advertisement from the Wellesley News, the student newspaper of Wellesley College, from the late 1910s. We get frustrated when we see ads for Christmas before Halloween. Consider that this ad was published in September and that is likely to stun you. What's more is how the ad tries to capitalize not just on Christmas but also seems to be trying to profit from the war as well but connecting their store with being patriotic. Apparently, George Bush was not the first to make such dubious connections. This submission is part of the Image of the Week series. For access to all photos, which are open for reuse under a Creative Commons License, check out the full album on Flickr. By Any Other Nerd Blog by Lance Eaton is licensed under a Creative Commons Attribution-ShareAlike 3.0 Unported License.